India and Nepal, 13th edition of joint military exercise called as ‘Surya Kiran-XIII’, will be conducted at Pithoragarh, Uttarakhand. The Surya Kiran-XIII is a 2-week long joint military exercise, scheduled to be held from 30 May 2018 to 12 June 2018. 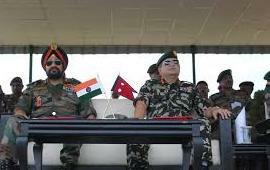 The Surya Kiran-XIII joint military exercise aims to further increase and strengthen the level of defence cooperation between the two neighboring countries India-Nepal. The Surya Kiran-XIII joint military exercise will see the participation of nearly 300 soldiers from both Indian and Nepal Army where they will share their experiences gained during the conduct of various counter insurgency and counter terrorism operations in the past. The Surya Kiran-XIII joint military exercise also aims to conduct battalion level joint training with emphasis on counter terrorism operations in mountainous terrain under the United Nations mandate. It also includes various aspects of disaster management and joint effort towards relief work. Surya Kiran series of bilateral military exercises are conducted bi-annually, alternatively in India and Nepal. Surya Kiran military exercise is the largest exercise in terms of troop’s participation in series of military training exercises undertaken by India with various countries. Surya Kiran military exercise mainly focuses at promoting military relations and increasing interoperability armies of both countries. The 12th edition of this exercise was held at Nepal Army Battle School (NABS) in Saljhandi, Nepal in September 2017.